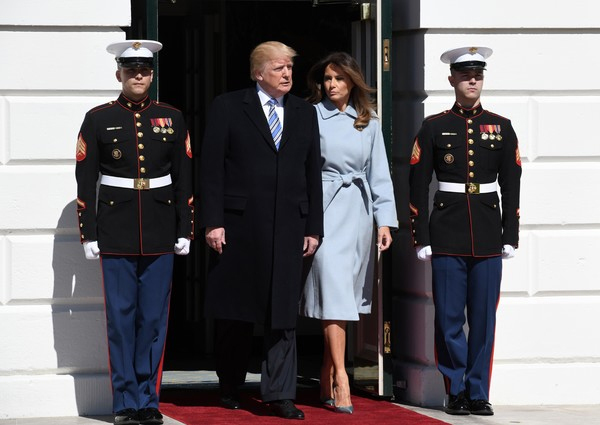 Love this coat on Melania. Getty Images North America. 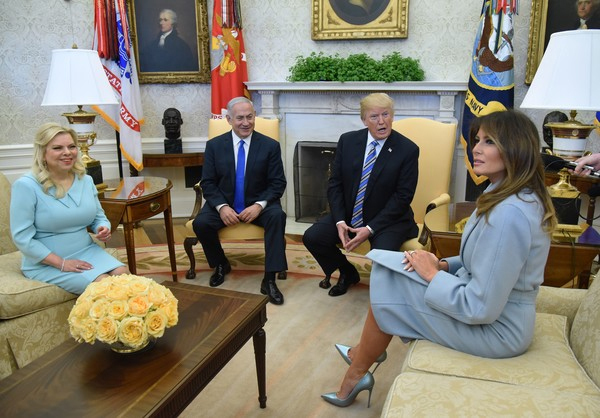 While looking for more detailed photos of Melania in her beautiful green leopard Brandon Maxwell dress, I came across this set of her during a recent White House visit made by Israeli Prime Minister Benjamin Netanyahu and his wife Sara. I feel like it was established right from the Inauguration that Ice Blue is one of Mel’s colors! So of course she looks very elegant in this belted coat. I don’t know who makes it but it is gorgeous and suits her well. Inside, during a visit from Netanyahu and his wife Sara. Getty Images North America. What stopped me in my tracks, however, was the height of her shoes. They must be at least 4-½ inches tall and I’m guessing they are by Christian Louboutin but I can’t quite tell if I am seeing the trademark red Louboutin sole or not. If they are Loubs, I know those can go as high as 120mm (or maybe even higher? ), which roughly translates to 4.72 inches, ouchy ouch ouch. I admire Mel’s high heel walking skills (I would love to take a class from her on the subject), but I have to wonder if these are actually shoes she wore because she knew she wouldn’t be walking much. High heels to sit in! Now this I could do with no problem. I love the metallic sheen to them The color seems like something from the 60s, but the heel height is definitely today! Melania in the highest of heels! Photo Getty Images North America. Let me know what you think of this look on Melania and if nearly 5-inch heels would present a problem for you like they would for me (unless we are all seated, of course). Personally i love her style- i know people get a bit emotional bc of her husband but if you just saw her - her outfits are fabulous and her stylist is earning his keep - forget his name?? I think she is a beautiful woman and dresses impeccably. I do truly wish the media would stop tearing her apart - she is not her husband and should not be judged ! Her complexion and hair allow every color to work well. Love the Arctic Blues, Dior Red, and Winter White which nobody else can match. Every coat in lovely color, perfect fit and ALWAYS belted. Now every gal wants to wear 5 inch Hurricane Loubs...Melania walks into a CAT-5 like she owns the joint. Melania looks absolutely wonderful love her outfits!! I bet the designers who choose not to style Melania are sorry now. She has become a fashion icon despite all her haters. Artic Blue is a difficult color to wear for most, but Melania just rocks its. Her shoes are beautiful but look painful to wear. 5 inch stiletto heels for me would be an accident waiting to happen, even when I was young.